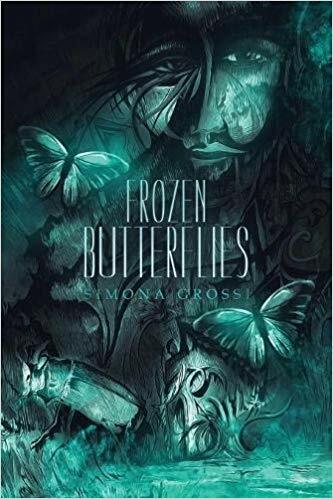 “FROZEN BUTTERFLIES“, a book by Italian native and renaissance woman Simona Grossi, delves into the subdued hues and shadows that encompass the life and mind of a woman with a traumatic past and routine present. Author and Professor Simona Grossi. Psychology professor and author Susan Blanc has insomnia. Seemingly bored with life, one late night she finds herself in a nightclub where she meets Nick, an edgy blogger trying to figure out the topic for his next entry. The immediate connection she feels with him leads Susan to his apartment where she sees an old journal Nick found on a bus. The journal’s author, Andrew, is distraught over his girlfriend’s leaving him. His writing resonates so deeply with Susan, that she suggests Nick use his blog to try to find the owner. This is the catalyst for the action of the novel and the physical journey that leads Susan and Nick to New York City in the search for Andrew. However, the journey for Susan is far more complicated than one that merely takes her across the country. Her journey of self-discovery is a dark, confusing, and sometimes mentally and physically self-abusive one. I feel like there are two parts of the book with distinctive styles. While in LA, the chapters seem to revel in brief conversations, literary choices (journal entries and blogs), and interactions. Andrew, they find, is a graphic novelist. Susan admittedly finds comfort in the isolation of shadows and enjoys the black and white graphic novels over the colorful ones. It’s more than just a preference for her. This has been her comfort zone since she was a child. I had difficulty getting into a steady flow of reading while they were in LA. I feel like Grossi was trying to make this part of the novel as much like a graphic novel as possible by giving us sparse dialogue but describing lots of insignificant details to paint the dim scenes and brooding mood. The combination made reading significant portions in one sitting challenging. As their search takes Susan and Nick to New York City, where they are coincidentally both from, the tone of the book shifts. No longer is it just the two of them on a quest. They reunite with their individual pasts. The shadows are still there, but the number of people in their sphere expands. This leads to a whole new world of inner turmoil for Susan as she is confronted with traumatic memories of her past as well as painful truths of her present. As the characters’ universe expanded, so did the need for a different method of relaying their story. No longer was Susan focusing on blogs and journals, now she was communicating via writing full articles and novels. The crux of the story, it turns out, is not the great search for Andrew or even the relationship between Susan and Nick, but Susan’s emotional journey and mental state that ultimately drive the story. As things began to flow more for Susan, so did Grossi’s style of writing. It seemed there were fewer descriptions of the settings and more concentration on the characters themselves. This is especially true regarding the turmoil of Susan’s mental state. Even as the subject matter got darker, the easier flow of the words made it more enjoyable to read. “Looking for Clara”, another novel by Simona Grossi. I was frustrated at times by what seemed like forced silences. The characters would be having deeply meaningful moments but were completely stilted or achingly obtuse in their conversations. No one would give a straight answer or just say what they were thinking. There are times where I wasn’t sure if what I was reading was supposed to be a dream or maybe a memoir inside a memoir. People would answer questions or comment on something Susan only uttered in her mind and nothing was made of it. Maybe it was supposed to make the reader uncomfortable? Even with these quirks, the intriguing storms within Susan’s mind kept the story interesting and had me eager to see how it all ends. Among the emotions I experienced while reading “FROZEN BUTTERFLIES” were intrigue, confusion, sadness, concern, annoyance, anxiety, and interest but never bored, which made it a worthwhile read. Next Product Review: Undercover Quinoa are deceptively delicious!